Wistful but well-behaved wandering woofers wondering where the wanted warmer weather went…. Ruby and Winnie enjoyed their romp at Nose Hill this afternoon. Whilst it was bright and sunny and at times the wind was slightly kinder than it has been recently, both Ruby and Winnie were wondering (whilst wandering and sometimes woofing) where the warmer and more welcome weather that had been promised for today went. Me too! 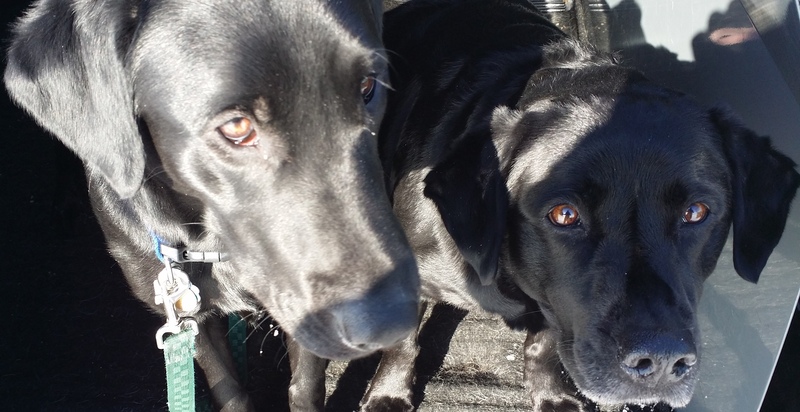 This entry was posted in Dogs, Musings, The Universe, Weather and tagged Black Labradors, Calgary Weather, Labradors, Nose Hill, Ruby, wandering woofers, warm, weather, Winnie. Bookmark the permalink. ← Should dogs wear parkas…?